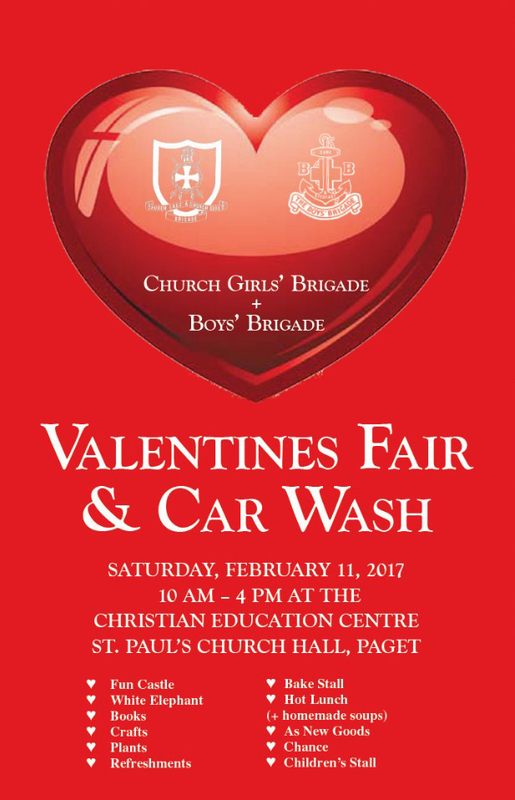 The Bermuda Boys and Church Girls Brigades are getting set to hold their 2017 Valentine’s Fair & Car Wash on February 11 at St. Paul’s Church hall and car park in Paget from 10.00am to 4.00pm. The event will include a fun castle, books, crafts, plants, refreshments, bake stall, hot lunch, children’s stall, and more. The car wash will cost $20 for small and regular-sized cars and $25 for large cars and vans. A spokesperson said, “This year is the 25th anniversary of the Church Girls Brigade in Bermuda – we are trying to make this year’s fair extra special. “Lunch will be offered with the usual delicious homemade soups, chili, hotdogs, codfish balls and chicken wingettes. Please spread the word about this worth while event. The money raised is used to help run the groups all year. Thank you.